​During spring 2014, Room 2 students studied the behavioral and physical adaptations of bees, particularly honey bees, as well as the bee crisis. They conducted a survey of community members to understand popular misconceptions about bees that may contribute to their dwindling numbers. They then met with beekeepers and consulted numerous print and digital sources to understand the science of bees and how they contribute to a thriving ecosystem. 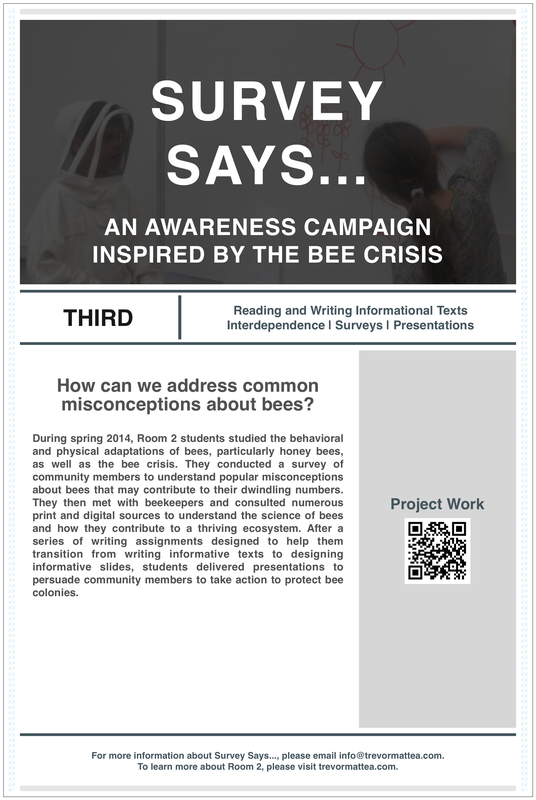 After a series of writing assignments designed to help them transition from writing informative texts to designing informative slides, students delivered oral presentations to persuade community members to take action to protect bee colonies.